Change is all around us, in many shapes and guises. Yet the nucleus of most of the shifts that have us feeling like we’re in a transformational maelstrom is speed. Everything happens faster now. Awareness can be captured more quickly than ever before. Sales can be closed instantly online. Customer service issues can be resolved in 140 characters on Twitter. And the social Web can spread a crisis with breathtaking swiftness. Marketing and communication has moved from a series of lakes (campaign>>analyze>>modify>>repeat), to a waterfall where you’re doing the communicating and the analyzing and the modifying all at once, every day. As marketers, we weren’t trained for this. Especially on the client side, where personnel is spread thin and responsibilities are increasingly numerous, keeping the company at the crest of the real-time revolution is a very difficult proposition. And that’s where agencies should help. That was the premise of my presentation to the BOLO 2010 conference in Scottsdale this week, where 150+ agency principles convened to drill deep into the speedy digital future of professional marketing services. To succeed as an agency in a world where contemplation is a quaint anachronism, you must shape-shift. You must redefine what it means to be an agency, and provide the services and strategic guidance that clients cannot provide themselves. That means not trying to build a social services department that solely sets up Twitter accounts and Facebook pages for businesses. There’s no secret sauce there. There’s not even a secret. Or sauce. Help companies map and integrate the social Web within their organizations. Assist with the creation of social media guidance councils. Help with the adoption, propagation and training of social media guidelines and policies. Help companies look for ways to succeed in The Opportunity Economy. Find ways to insert clients authentically and contextually in social dialogues. Take clients’ message and deconstruct them like a fancy caesar salad. Atomize content (thanks Todd Defren) by taking a big idea and turning it into many small content executions, spread around the social Web like a digital dandelion. Help clients understand the relationship that prospective clients have with them today, and how to move people from interest to advocacy. Help clients humanize their brands and in so doing drive kinship and purchase intent. Show clients how to activate their fans, not just collect them like baseball cards. If the clients of your agency don’t have a social media crisis plan, and a crisis occurs, who do you think is going to be blamed for that? Not ensuring that clients understand how to gauge and effectively respond to a real-time viral incident is irresponsible – and a missed revenue opportunity. Whomever keeps score controls the budget eventually. Showing clients the myriad ways social media and real-time business can be effectively measured is a hallmark of smart agencies. In some cases, clients will want to manage and execute social and real-time programs in-house. It’s hard to argue, as it’s often difficult to outsource the humanization of a company. Agencies need to find a way to both educate and train their clients, while staying involved strategically and in a supervisory or advisory capacity. 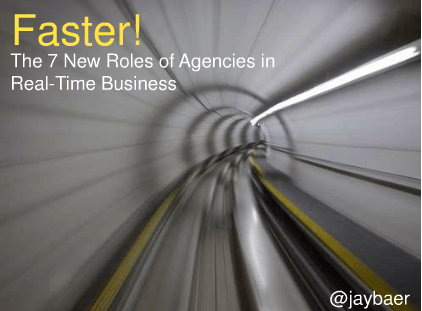 Changing the services your agency provides shouldn’t be viewed as a threat, but rather as an opportunity. Which of the 7 new roles are most viable for you, or your clients?